Auckland printmaker Shane Hansen has recently completed some new editions which is exciting news for collectors of contemporary NZ original prints. 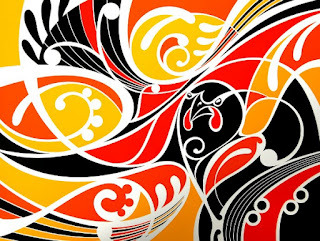 Artwork from the high profile Maori artist has been purchased in prestigious private commissions such as Air New Zealand's Koru Lounge at Auckland International Airport and a recent painting was included in the landmark Ngaa Pou Whenua show at Waikato Museum in 2011. Hansen's new work is building on a solid back catalogue of sold out print editions including his Friendy tiki series (Pania, Boy and Friendy et al on vintage wallpaper) and screenprints on plywood Te Kereru, Kokako & Aroha, Te Kea Aoraki etc. Shane Hansen - who is of Tainui - Ngati Hine, Ngati Mahunga descent - says about his new prints "The detail of my mahi [translation from Maori = work, to make], is in its simplicity. Keeping details to a minimum to acheive an image of high impact, depth and meaning is a challenge but I feel the work is stronger because of it. The term less is more is definitely the case with my work and it doesn't mean it is less meaningful." Based on an artwork for the ‘Living & Learning Centre’ in Henderson, West Auckland. This print represents the cultures, lifestyle and spirit of the Auckland area and also the people that inhabit it. In this print Shane tells us that "The Kokako is a kaitiaki (Maori = "guardian"), watching over the Waitakeres, helping forge a brighter future for the tamariki (Maori = Children). Looking down from the Waitakere ranges towards Rangitoto, the Kokako feels proud and privileged to be part of it all." Archival giclee print in an edition of 35 signed and numbered by Hansen. Hansen says that this print was inspired by an encounter he had with the unique NZ saddleback (tieke),"The handsome saddleback greeted me with surprise in his eyes", he told NZ Art Print News, "The bird seemed to be saying 'Who is this who seeks my attention? You have come, so I will go.'" Tieke belong to the Wattlebird family which includes the kokako and the (extinct) huia. In Maori the word Ataahua means beautiful. Ataahua Tieke is available in two colourways, green and gold (the Gold edition is shown here) in editions of 35 prints. See all prints by Shane Hansen in the Shane Hansen collection at New Zealand Fine Prints, his work also features in the Maori art collection at New Zealand's specialist art print store. Retro or Vintage? How do we classify prints?